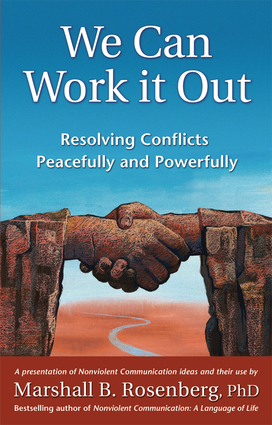 In over 40 years of mediating conflicts—between parents and children, husbands and wives, management and workers, police and communities, and warring groups around the world—Marshall Rosenberg has learned it is possible to resolve conflicts peacefully, and to everyone's satisfaction. It's not compromise—it's a caring and respectful quality of connection between the parties in conflict that meets everyone's needs.Get to the Heart of the Matter—Most of us lack the vocabulary to express what we're feeling or needing, but we are well trained at pointing fingers at others as the "cause" of our pain. When people trust that their feelings and needs are valued - and heard - it immediately helps reduce tension and hostility, opening the door for peaceful resolution. Applying Dr. Rosenberg's Nonviolent Communication (NVC) process inspires genuine cooperation by focusing on the unmet needs behind the conflict. Whether you're a professional mediator or wishing to resolve a conflict with your spouse, child or colleague, NVC offers practical, usable technique to get to the heart of the issue.